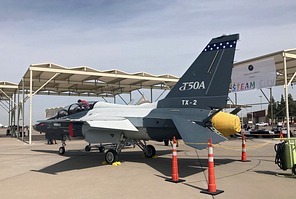 Jeremy Meyers contributes his report from the air show of Luke Air Force Base, home of the 56th Fighting Wing that is dedicated to training F-16 and F-35A fighter pilots. One of the most anticipated US airshows on a biannual rotation in 2018 happened at Luke AFB, Arizona, on March 17 and 18th. 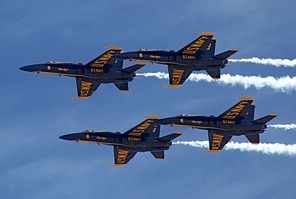 This year was particularly of interest when in light of the USAF Thunderbirds change of leadership and subsequent slower start to the season the event coordinators of Luke Days secured an open date of the USN Blue Angels. 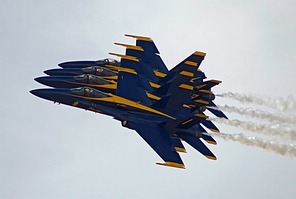 The last time the Blue Angels graced the skies of Luke was in 1992. This drew huge crowds and made it one of the premier events also hosting for the first time in 7 years the Air Combat Command A-10 Demonstration Team full tactical air display. This year marked an especially unique year in the performers that were on hand. Representing the Air Force Academy and bringing in the stars and stripes was the ever popular Wings of Blue Parachute team. Their narration brings an excitement to the display that rivals that of the absent and more commonly attending Army Golden Knights. Kicking flying displays off in his one of a kind Stearman was Gary Rower. This graceful routine is becoming more and more rare on the circuit and Gary pairs the Apollo 13 music with tones of original barnstormers for a stand out display. The Blue Angels parked off to the left side of airshow grounds instead of on the inside runway as the Thunderbirds do when performing at Luke, so there was nothing to block the avid photographers that came out to see. 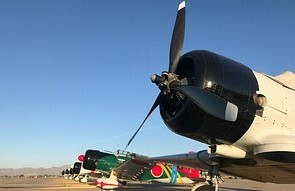 Others of note includes the Desert Rats in their CJ-6s, Bob Freeman in his Extra 330, Buck Roetman in his Pitts, the Tuskegee Airmen P-51C Mustang , John Klatt in the Screaming Sasquatch, Kirby Chambliss and the Red Bull air force, and Bill Stein in his colorful Edge 540. I would like to pay special tribute to Dan Buchanan who flew Saturday and Sunday. As many of you know, the airshow community lost one of the greats later in the season following a tragic accident at Mountain Home. It is a privilege to have seen Dan Buchanan perform one last time. Not many other acts bring the fire and noise than that of the Tora Tora Tora. An added bonus was the CAF Mesa wing’s involvement, with the B-17 “Sentimental Journey” being added to the routine in a marvelous display of warbirds and history coming to life. On the Saturday, as a military member, I had the chance to watch the Tora Tora Tora aircraft up close and help with ground operations before and after their display, which was a dream come true and added a certain flare to the whole airshow experience for me. Kicking things up a notch was the home town airfield attack with a pair of F-16s and a pair of F-35s from Luke. Adding to the display again was an HH-60G and a MC-130J from Davis Monthan complete with a paratrooper drop and SAR demonstration. The F-16s and F-35s dropped flares and simulated an airfield attack, showing the capabilities of the aircraft and the result of the training the 56th FW engages to secure the future of airpower. Following the airfield attack display were two of in my mind the best civilian performers on the circuit currently. First up was Brad Wursten for his first appearance at Luke Days in his MXS. This high energy display has remnants of the late of Greg Poe and has some one of a kind maneuvers to include the famous thumbs up to close the display. His red, white and blue MXS paint scheme also adds to the sense of patriotism and love of aviation tumbles. Bringing us to the jet age and reliving the history of training in the USAF was none other than Greg “Wired” Colyer in his T-33 “Acemaker II”. The T-33 may not have afterburner but Greg has developed an outstanding routine and he nowadays has two planes, doubling his presence on the airshow circuit that is unrivaled. Moving back into the military jets was the Luke AFB F-35 Heritage Flight team followed by the A-10 demo team. Hailing from Davis Monthan AFB, Captain Cody “Shiv” Wilton put it through its paces. Having the Warthog back on the circuit was one of the most highly anticipated prospects for the 2018 season. On the Friday, the Heritage Flight was a two-ship of the F-35 and A-10, while the Saturday saw the F-35/A-10 joined by a P-51D Mustang, and the Sunday a F-22 joined the formation after a surprise visit by the F-22 Raptor team who had displayed at nearby MCAS Yuma the day before. A shout out to the organizers and the F-22 demo team for dropping in making a rare four-ship Heritage Flight routine. Wrapping up the show each day were the Blue Angels. 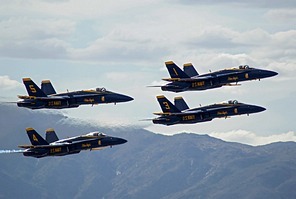 Even with the noticeable and significant absence of the Fat Albert, the Blue Angels put on their typical display of excellence. Even on the far runway there was plenty of space to catch the diamond takeoff from west to east end and the solos with Lt Tyler Davis in #6 taking off the same direction as the diamond and LCDR Brandon Hemplar blasting into the desert sky from east to west. On the Sunday there was a mechanical issue with #5 who landed just after the five-plane loop and without missing a beat returned to the skies for the remainder of the routine in the spare #7 jet. 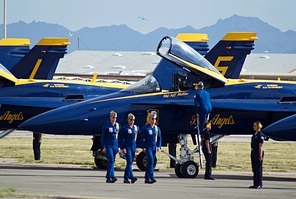 Let us hope it will not be another 23 years before the Blue Angels come back to Luke Days. On a final note of interest, in the static park was one of two examples of the KAI/Lockheed Martin T-50A version, produced by Lockheed Martin for the Air Force’s T-X program to select a T-38 replacement. Additionally, there were plenty of warbirds, and modern fighters including three examples of a F-35A, from Italy, Norway and the USAF. There were also three F-16s, from the 21st, 425th and 309th Fighter Squadrons stationed at Luke. Even a F-15E, F-15C, F-22A, and A-10C were on hand. Perhaps no other aircraft was looked at more than the AC-130U gunship that arrived after the Friday’s practice. We will look forward to the next one somewhere around the spring of 2020 and until then let Luke do what it does best; training the future of airpower!